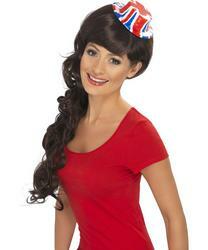 Look gorgeous come the Queen's Diamond Jubilee 2012 or the London Olympics and support Great Britain with this fabulous Union Jack Wings, Wand and Tiara Set. The accessory set includes a British flag printed glittery wings on an elasticated strap, a hand held star shaped wand with red, white and blue shiny decoration. The crowning piece is a beautiful silver coloured tiara which sits on top of your head.